Available in Mens or Womens sizes. 100% Kevlar Jersey outer layer, Hot mill style with banded top cuff. Sold with right and left hand gloves. 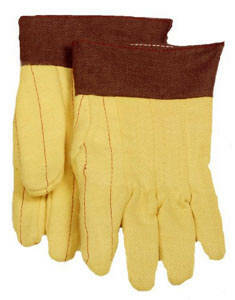 These gloves offer the highest heat protection of all our Kevlar gloves. You can hold the work piece in your hand (please note the temperature rating) when a tong is not practical.